One of the biggest trends that impacted the grocery sector in 2018 was online ordering. In the US, consumer spending online for groceries is increasing and forecasted to grow 15% in 2019 versus the previous year, bringing the overall share captured by online grocery in 2019 to 6.3%. By 2022, online grocery is forecasted to represent 12% of total US grocery sales according to a report published by Nielsen. In the UK, sales in online grocery increased by 9% and now account for a 7.5% share of all grocery sales over the last 12 weeks according to a Nielsen report. With a 7.5% share of all grocery sales, the UK is estimated to have the highest grocery e-commerce penetration rate across Europe, followed by France with 5.6%. There are a few factors that create a favourable environment for growth of the online grocery market in the UK. Firstly, the UK is already one the most mature e-commerce markets and consumers are confident enough to purchase products online. High mobile phone penetration and improved interfaces for websites and mobile apps as well as the rise of crowd-sourced home delivery models are other triggers that influence the adoption of online grocery shopping. Finally, the UK market is dominated by well-capitalised supermarket chains, such as Asda, Morrison’s, Sainsbury and Tesco, which have significant resources to execute grocery e-retail. Nonetheless, the fast growth rate of the online grocery market presents a challenge for even the biggest supermarket chains which are competing for market share and trying to balance their online and offline investments. The key supermarkets in the UK already have an online presence and are increasingly relying on digital solutions to maintain their competitive advantage online. Currently, Tesco trials a robot delivery service in Milton Keynes. Tech company Starship Technologies is now delivering online orders from Tesco’s Kingston Centre to customers within a two-mile radius of the store. The buggies, which are 55cm high and 70cm long, can carry up to 10kg of groceries and make unmanned deliveries within 15 minutes. Equipped GPS tracking and sensors allow them to dodge pedestrians and other obstacles. Tesco ran a one-off trial of the buggies in 2017, but has now formally launched the delivery service from the Tesco store in Kingston Centre, Milton Keynes. Co-op’s initiative to move into the e-commerce market is a clear testimony that supermarkets don’t want to get left behind and that the pressure to get on board is intensifying. Last week, Co-op appointed a director of e-commerce, signalling its intention to start selling online. 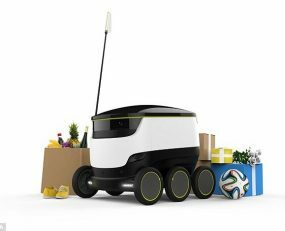 Currently, the only way consumers can buy Co-op groceries online is through a trial that utilises robots for delivery from a single store in Milton Keynes. Another, bigger trial was launched last year, paving the way for a bigger online offerings and on-demand delivery. The trial provides a new way to offer home delivery of groceries bought in store, using taxis and couriers instead of Co-op’s own vans and staff. The trial is underway in 12 branches across the UK. Across the pond, the competition between companies such as Amazon, Walmart, Target and Kroger is also heating up. Last year, in a bid to take on Amazon and Walmart, Target acquired Shipt, a last-mile technology company, to start offering same-day delivery on grocery items. Meanwhile, Walmart is testing a crowd-sourced last-mile delivery, Spark Delivery, and also offers three-hour deliveries in major cities. Components of Spark Delivery are powered by Bringg, a logistics technology platform. Bringg gives Walmart the ability to optimise driver schedules, automatically dispatch orders, allow drivers to communicate their availability and send smart alerts to make sure deliveries are picked up, queued and delivered on time. Other services that Bringg offers include running click-and-collect schemes, managing “crowd-sourced” fleets, and returns. It should be expected that technology initiatives like those mentioned will reduce the cost to delivery and the cost of picking. This in turn should enable more grocers to enter the market and incumbents to source additional growth. We should therefore expect more supermarkets to jump on the e-retail bandwagon to ensure they remain relevant to consumers’ lifestyles, but also expect new competitors enabled by technology which will impact the current supermarket dominance. While the market might still be small, there has been a sizable uptick in demand for online grocery shopping that grocery players can tap into.